The Leatt X-Frame Knee Brace is part of the latest Leatt collection. The X-Frame Knee Brace is made of Injected Carbon Composite and is the latest innovation in the Leatt knee brace range. Engineered to help reduce forces to the knee, it limits knee injuries and is CE certified as both a medical device and as impact protection. Sporting asymmetrical hinges, the inner hinge is 40% slimmer, providing superior bike feel during riding, whereas the outer hinge's durable metal gears offer precise movement. The X-Frame provides a comfortable fit with an easy strapping system, interchangeable hinge padding sizes, and a low-profile shin bone pad that fits inside all boots. The UK's No 1 Motorcycle & Motorcross Accessories Store. View All Parts & Spares. Clothing > Armour & Protection. In Stock Available for Dispatch Today. Thrills come at a cost! But have no fear Leatt have you covered, with a full range of body armour, braces, guards, hydration systems and apparel. Leatt strive to do whatever it takes to keep a committed thrillseeker safe, Over the years Leatt have continued to combine safety with affordability, making sure that riders have the confidence and equipment to go harder and further than before. 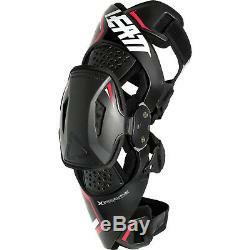 The Leatt X-Frame Knee Brace is packed with features..
40% slimmer inner hinge for superior bike feel. Metal geared outer hinge for precise movement and durability. Reduction of forces to limit knee injuries - ACL, Meniscus and MCL. Certified as medical device - EU CA014741 and USA FDA 10048761. CE tested and certified as impact protection - Knee EN1621-1. Fixed hyper flexion stoppers for meniscus injury reduction. 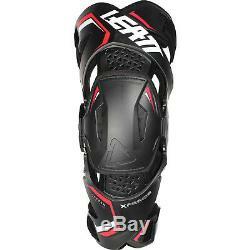 Low-profile shin bone pad that fits inside all boots. Comfortable and easy fitting strap system. Customized fit with interchangeable hinge padding sizes. Your package will include the following. Leatt Knee Brace Sizing Guide. Please use the conversion tables below to determine the right size for you. This product has no reviews yet, however see what our buyers say about our other products..
(Only 1 free return per order). In most cases if you qualify for a Free Return a return label will be sent with your order for your to use. Before using the CollectPlus service please ensure you read the CollectPlus FAQ's below to ensure your return is covered within their service. The most important thing to bear in mind is the dimension must not exceed 60x50x50 cm and should not weigh more than 10kg. The CollectPlus Service is a quick and easy way to return your item. As an International customer, you can return your parcel using any postal service. Once the item arrives back at our warehouse, a member of our customer service team will contact you within 24hrs to discuss the return. During festive and sales periods this may be extended slightly. Sign up for our latest News & offers. 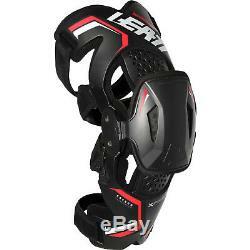 The item "Leatt X-Frame Knee Brace Motocross Protector Support Off Road MX ATV Dirt Bike" is in sale since Tuesday, March 27, 2018. This item is in the category "Vehicle Parts & Accessories\Clothing, Helmets & Protection\Body Armour & Protectors\Knee Pads & Shin Guards". The seller is "ghostbikes_uk" and is located in Preston.